Review by AllTheBestFights.com: 2015-12-31, fight not particularly good between Peter Aerts and Baruto Kaito: it gets two stars. 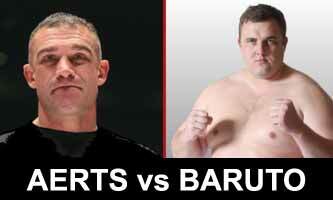 The former K-1, Ikbf and Wmta world champion Peter Aerts (who replaces Jerome Le Banner) entered this fight with a pro mma record of 1-1-0 (but he has a kickboxing record of 105-34-2) while his opponent, the 31-year-old former professional sumo wrestler Baruto Kaito (14 years younger than Aerts) is at his professional mma debut. In In his last K-1 fight Aerts was defeated by Ernesto Hoost (October 19, 2014 Aerts vs Hoost 6). Aerts vs Baruto is on the undercard of Fedor Emelianenko vs Singh Jaideep – Rizin FF 2. Watch the video and rate this fight!